I have been really excited to post this recipe! It isn’t the right color for the whole St. Paddy’s day sha-bang, so I had to wait, but this one is really really awesome!!! It seems like we are always eating pancakes at our house. They are quick, they are simple and they taste good. But sometimes its not about time or simplicity but just because they are an easy fall-back. I know Limi is going to like them and he doesn’t feel like a ginny pig. 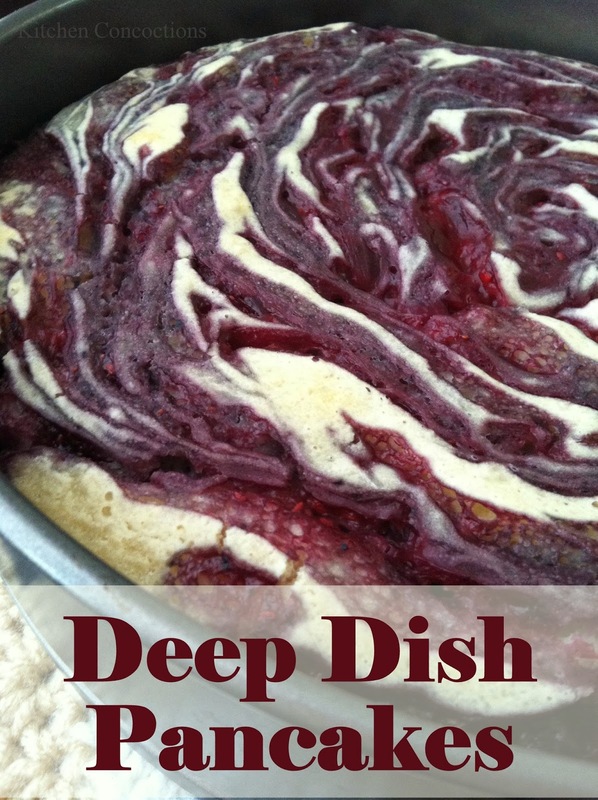 Well I think this deep dish pancake is going to be my new fall-back. Wow it is good! I cannot think of a single thing that could make it better. It is moist, it is sweet, it has berries and it is just so scrumptious. If I owned a bed and breakfast there are only 3 things I would really have to put on the breakfast menu, no matter what, and this is one of them (the other two are Orange Dream Pancakes and Stuffed French Toast). As you can tell, I seriously love my sweet breakfast foods. To make the berry Medley sauce, combine all the ingredients in a sauce pan over medium-high heat. Stir frequently until the sugar is dissolved and the sauce has come to a boil. Once the sauce has thickened remove it from the heat. Put the pancake batter in a 12-inch greased cake pan. Drizzle 2 cups of the berry sauce in a spiral around the pan. Then use a spoon to swirl the berry sauce into the pancake even more. Bake for 30 to 35 minutes, until a toothpick inserted in the center comes out clean. Cut into 6 pieces and top with butter, maple syrup and additional Berry Medley sauce. Recipe adapted from Oh Bite It!